It looks as if reactions to the movie will prove very mixed – less divisive than The Last Jedi maybe, but what isn't? For my part, I’d say it lacks the highs of that episode but also manages to avoid the lows. 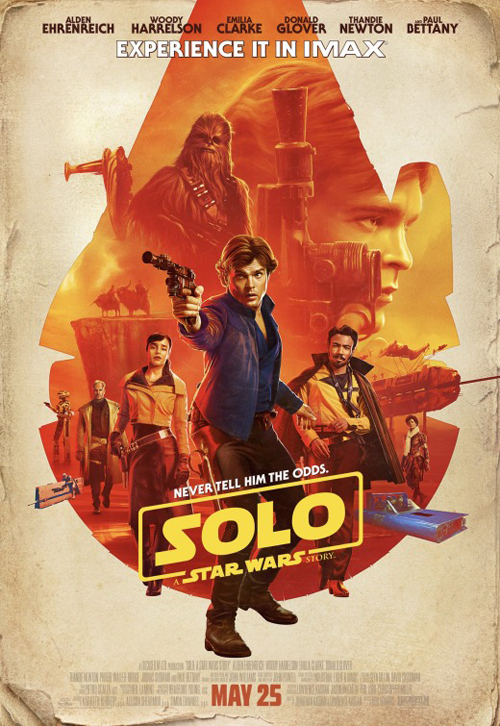 Solo has going for it, besides a pitch-perfect central relationship between Han and Chewie (Joonas Suotamo), a very solid meat-and-potatoes screenplay from Jonathan and Lawrence Kasdan, refreshing in itself after a trio of movies at best only partially delivering on that score. It’s also Howard putting it his best journeyman foot forward (so the guy who made Ransom, Rush and Apollo 13 rather than the Da Vinci Codes or Russell Crowe Oscar bait); you wouldn’t be remotely aware of the production issues if you watched it cold, and you wouldn’t recognise the work here as bearing any relation to the earlier Lucasfilm helmer, the one who delivered a leaden Star Wars-with-Lord of the Rings chainmail franchise non-starter in Willow (lest we forget, he was also offered The Phantom Menace). If Solo loses its momentum a little during the middle act, there's nothing that compares to the deal breaker of Canto Bight in The Last Jedi. The first forty minutes or so charge forward with commendable confidence (rather than as if they’re blundering about, hoping to seize upon some kind of narrative thread or purpose). Sure, potentially infuriating motifs surface: how Han got his name – as someone pointed out, if you absolutely have to go there, it makes much more sense for him to brand himself as a loner through a false sense of bravado – got his gun etc. But for whatever reason, they weren't intrusive to the point of distraction, any more than namechecking Bossk of having Paul Bettany's villain Dryden Vos show off a prominent suit of Mandalorian armour in his den (because he once was one?) It’s a case of mileage may vary, I guess. I liked the circumstances of Han meeting Chewbacca and their almost instantaneous rapport (less keen on Chewie's yen to free his people, as it feels like a futile attempt to bridge his unwise Revenge of the Sith presence with the Original Trilogy). The opening scenes on Corellia are largely a success, complete with Jabba-variant crime boss Lady Proxima (voiced by Linda Hunt; instead of a slug, a slithery mollusc thing) and a precursor scene in which Han tries to talk his way out of trouble. Where things stumble amounts to one of the picture's more pervasive missteps, signposted by the trailers and her more general career (I'll give her Me Before You): Emilia Clarke. If Bettany as Vos is a good Blake's 7 performance in search of a character (he has the occasional nice line – "Alright, let’s eat a little, drink a lot, and talk privately" – and I like how he greets Chewbacca, but he can only do so much), Qi'ra is a character with potential – more so than either of the saga's other recent lead female characters (Rey and Jyn) – in search of a strong performance. The Kasdans have set her up with a strong arc, omitting to reveal everything in a purposeful manner and leaving the door open for further conflicting loyalties and a sequel rematch. Unfortunately, I've no interest in seeing whatever Qi'ra gets up to next because Clarke is so unengaging. She's not even actively bad; she's just bland. One might make the case that her obviously-wrong-for-him presence helps underpin Han's future disenchantment and cynicism, eventually turning him into the Harrison we know, but it's more impactful if we can appreciate in the first place why he feels so much for the woman who betrays him (also on the debit side, it's true that their reunion on Mimban is a coincidence screaming for some kind of valid explanation, but I was honestly more relieved that we didn’t have to go through a "return to Corellia for the girl Han loves" number). Han's embarking on fully fledged outlaw career has fewer encumbrances, mainly because Woody Harrelson is effortlessly winning as quasi-mentor Tobias Beckett. It's also a nice touch that Han's been serving in the Empire for two-and-a-half years before he absconds (much more daring in itself than Finn's five-minute flirtation with the First Order); and those "Join the Empire" promo reels are marvellous, taking their cues from Starship Troopers' satirical bent. Ehrenreich and Harrelson bounce agreeably off each other, and the Kasdans set up the various twists and double-crosses with aplomb. True, Jon Favreau's multi-armed pilot Rio Durant leaves little impression, and Thandie Newton's Val Beckett is entirely underserved (particularly her self-immolation for no good reason), but the Vandor train heist is excitingly staged, and if Han's honourable side winning out occasionally strays across a fine line into over-emphasis (having Qi'ra and Tobias extol as much at various points is unnecessarily on-the-nose), I generally think the Han-does-the-right-thing aspect goes the only way it can for the movie. After all, he doesn't break off his mission to help Chewie in the revolt on Kessel. And he isn't such a good guy that he doesn't shoot Beckett first; you can bet that's (Larry) Kasdan saying "No way are you getting away with that Greedo retcon, George". That he opts to aid the Cloud Riders is a bit of a bitter pill, to the extent that their characterisation is on the winsome side (while it isn't wholly Erin Kellyman's fault that Enfys Nest is utterly unmemorable once unmasked – the reveal a call back to Boushh? – it doesn’t help that she’s entirely without presence). But it's consistent with that Han/Indy late '70s/ early '80s Ford characterisation, and very much Temple of Doom meets Beyond Thunderdome in its anti-hero aiding the kids and downtrodden. It's also a pill that goes down better for the plot elements thrown into the mix in tandem – the ruses and strategies. What really, entirely, uncontestably doesn't work in this movie is Phoebe Waller-Bridge's L3-37. It's an attempt at contemporary humour and delivery as jarring as those podrace commentators in The Phantom Menace (one element Rogue One got contrastingly right was making it's droid actually funny – and affecting when it sacrificed itself). None of her jokes land (many laced with off-beam sexual innuendo) and the performance generally feels as if the producers knew this wasn't working tonally but were afraid to add it to the litany of busts littering the production's history; certainly, if this was representative of the approach Lord and Miller were taking, we dodged a bullet when Kathleen Kennedy called time. Consequently, nothing related to the L3 carries weight, including her initiating the rebellion on Kessell and most importantly her relationship with Lando. It's impossible to see what he's getting worked up about when she croaks, which in succession to the demises of Rio and Val means the movie's on a par with Rogue One for seeding indifference to deaths of its characters. Except that in L3's case I was actively relieved. The Kessel Run sequence, with its Lovecraftian space squid – Harrelson’s scream on seeing it is one of the movie’s funniest moments – is fun but unremarkable for such a famous element of lore. You could argue it as a reflection of Han's "you should have seen the one that got away" boasting, but mostly it’s a problem with the time vs distance definition of a parsec. Whether a parsec in Star Wars is a reference to one or the other – officially, it's the latter, and played out here accordingly – it's largely received by casual viewers (non-ardent fans), and Han himself in A New Hope, as the former, making the run something of a disappointment when set alongside the (splinter of the) mind's eye's image of the race he was involved in. Nevertheless, the stacking of elements – the raw coaxium that will explode if they don’t get it processed in time – amounts to a solid foundation for the scene. On the one hand, it should be depressing that Lucasfilm is so enfeebled, they can't envision a Star Wars movie without the Force (or Imperial forces). But that isn't really what bothered me. I naturally assumed this must be some weak sauce generational thing, paralleling Kylo obsessed with grandpops; Darth Maulson out to avenge pappy's dismemberment with his recovered lightsabre etc. That it's actually Darth Maul is about as fanfic as it gets (which is very fanfic, given its prequel trilogy fanfic), the kind of thing you used to get with Darth Vader surviving the end of Return of the Jedi or the Emperor being cloned. You know, the product of a mind exhausted of any creative avenues (the sort of mind that comes up with the First Order or Starkiller Base). I didn't realise Maul surviving had the precedence of The Clone Wars– so was presumably Lucas endorsed – and Star Wars Rebels. That he found himself a pair of robot spider legs and then some normal robot ones (did he get himself some robot intestines too?) Or that he had numerous rematches with Obi-Wan Kenobi. Disappointing – to me at least – that the distinctive tones of Peter Serafinowicz weren’t reemployed along with Ray Park, and that instead it was his cartoon voice Sam Witwer. Apparently, those series are canon, so I guess we're unlikely to see Maul's second death at Ben’s hand in the mooted Obi-Wan movie as it’s already been done. As much as I was underwhelmed by Rogue One– and its clumsy intrusions of continuity, complete with eyesore virtual doubles – I left Solo moderately enthused. Crucially, Howard remembers that the Star Wars movies ought to have moments of enthralling uplift and abandon amidst the serious business, something the Disney era generally seems to have forgotten. Whether it's enough to make Solo the hit it might have been had it been released pre-The Last Jedi will become clear soon enough (its modest hype levels and predicted opening weekend are definitely a sign of a shift, and it can't just be put down to brand overexposure). We've just had a Boba Fett movie announced (to replace the Josh Trank one that didn't even get to that far), helmed by James Mangold, a sign that Lucasfilm is taking the safe pair of journeyman hands approach we saw here with Howard rather than resting hope on chancy new blood and fresh takes. But it should probably be more of a surprise Kennedy wasn't doing that anyway, given the conservative storylines that have informed the Disney era. Even Rian Johnson has been more characterised by what he reacted against than what he introduced. Solo: A Star Wars Story is clearly setting up a Solo 2 (Han off to create a rift with Jabba), but if this one stiffs – by which I mean, makes under a billion, particularly since, cost-wise, they filmed it twice – we could find plot elements transferred into the mooted Lando spinoff. Which, and I'd never have countenanced this back when I had a bad feeling about Solo, would be a shame.